Yes, Ladies and Gentlemen, once again American Democracy has been saved by the foresight and determination of one plucky young(ish) absentee voter hiding out in the wilds of deepest, darkest Dublin. This morning I got off my backside and exercised my democratic mandate through both the simultaneous requesting of an absentee ballot (FPCA) from the great state of Connecticut, and the submission of a Federal Write-In Absentee Ballot (FWAB) in case the FPCA does not get processed in time*. So my vote has been submitted, but only time will tell if my vote will ever actually be counted; given the historical trend to only count military absentee votes in most states, I'm not that hopeful. And how did I vote? Well that is a secret between me and my printer that I will take to my grave, but regular readers might somehow be able to puzzle together an answer from the cryptic clues I have been leaving in posts throughout the last 18 months. Think of it as the Da Vinci Code, but true, and for literate adults. I know I am taking a risk casting my ballot before I have actually seen the candidates square off in a series of what will no doubt be fiery and decisive debates, but after the events of the last few weeks I'm willing to take that chance. And what were those events that finally convinced me which way to vote, me who thus far has so obviously been a swing voter? Was it the decision by one candidate when faced with a sudden explosive decompression in the polls linked to the imminent destruction of global capitalism at the hands of his bestest friends and campaign manager to try and cancel a potentially disastrous debate "in the national interest"? Was it the selection by that 72 year-old candidate with chronic health problems of a running mate with less than two years experience as a Governor of a state with less than 700,000 people and six years as Mayor of a town with less than 10,000 people? Was it the belief of that candidate's running mate that vegetarian dinosaurs and people frolicked side by side on the fertile planes of America less than 4,000 years ago? The insistence that she can see Russia from her house, despite it being 1,200km away? That climate change, if real, is all part of God's great plan to bring strawberries to Alaska in January so Jesus will have something nice to eat when He returns to smite the unworthy, and drilling in ANWR is thus the fulfilment of Biblical prophecy? Nope, it was in fact the belief of that candidate's running mate that it is acceptable to name one's children Track, Bristol, Willow, Piper and Trig. These are not children's names, they are Oil Rigs. I know my opinions on breeding are slightly controversial (in Ireland you need to get a licence from the government to own a television, but they let anyone have kids? Seriously, where's the logic in that? ), but people who make up names for their children by pulling random letters from a bag of Scrabble tiles are clearly demonstrating why they are the last people on earth who should ever be in the position of having children to assign names to. Just because America is the land where anyone *can* grow up to be President, doesn't mean it is the land where everyone *should* become President. Surely there must be some qualifications for the role? Even if the most strenuous of those qualifications was the ability to score more than five points** in a round of Scrabble, I'd settle for that over what we are being asked to swallow. Seriously, I know neo-cons are thinner on the ground than four years ago, but that's the best they could do for a running mate? *if the FPCA is processed in time and I do get sent my official ballot papers from CT, then I have been given the opportunity to both vote early and vote often. Unfortunately only one vote will actually count. 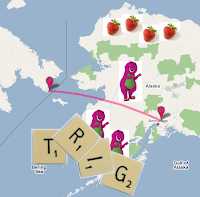 **to be fair, maybe Alaska is the geographic equivalent of a triple-word score tile, Hawaii, Florida and Maine being likewise.